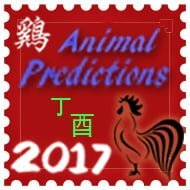 From 7th August 2017 to 6th September 2017 is the seventh month Wu Shen (Yang Earth Monkey) of the Ding You year (Yin Fire Rooster year) with the ruling energy of #2 in the central grid. The inauspicious black #2 star enters the central palace in August combined with the auspicious annual #1 star; it can cause problems to the reproductive system and stomach problems. Not a great combination for a bedroom or other important room. Use metal cures like a Wu Lou and/or a set of six Chinese coins tied in a row with red ribbon especially if you are not in good health or feel very stressed. Although unlikely but if your bedroom, office or main door is located in the centre of your home please make sure you do NOT introduce any candles here or colours red, pink, purple, orange or any other fire colour. If you have an important room here use some blue, grey or black objects like bed covering, floor covering or cushion covers. Please avoid and do not disturb the centre of your home or office this month. Be very careful this month if your main door, bedroom, lounge or office or any important room is located in the northwest. If your main door or an important room is located in the northwest, make sure you place a Wu Lou and/or a set of six Chinese coins tied in a row with red ribbon especially if you are not in good health or feel very stressed. Chen 3 Jade (Lu Cun Xing) is a wood star and a yang Trigram. It affects the feet, lungs, convulsions, liver, bladder, limbs and hysteria. You must be aware of possible theft, arguments, disputes, hot tempers, loss of wealth and legal problems especially if you have a main door or important room in the northwest this month. You should also hang a flat Ba Gua mirror with a Chinese i-ching coin on the back for added protection this month especially if you have a main door in the north. It pays to be wise and avoid taking too many risks for there may be unscrupulous people working against you. There are indications of misunderstandings, pressure and business rivalries that could also lead to losses. Keep this area quiet and doors and windows kept closed this month as much as possible. The good news is you now know this is an inauspicious star and you can do much to dissipate its negative influences for the month so do not panic at all. The 5 Yellow also called ‘Wu Huang or Lian Zhen’ in Chinese, is one of the bad monthly afflictions. It is an extremely unstable star. It has no gender and no trigram and is highly treacherous when disturbed. When disturbed, its malicious influence brings tragedy, sickness, lawsuits and major loss of wealth. Do be careful with it. Stillness together with water cures can keep its negative influences at bay and you must avoid using fire energy like reds and candles in this area this month. – A crystal globe is very good when placed in the northeast during August. 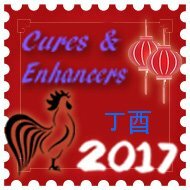 This area can also be very good for relationships this month and to enhance you should introduce some metal elements that are round in shape, a traditional enhancer and cure is a brass wu lou or any object that is round in shape and made from a good quality metal like brass copper, steel. Avoid having large quartz crystals (over 4 inches in size) in this area this month. 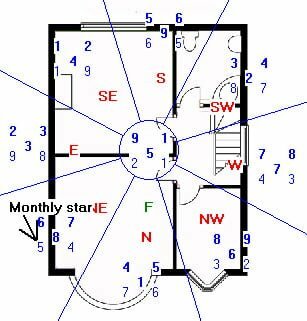 If you activate this area of the home this month it can bring in new opportunities, gains in financial investments, academic achievements and also romance and relationships as peach blossom is very good here during August. Those with a main door, office/study in this area will benefit greatly this month although the intensity of these characteristics will differ in varying degrees according to the influence of the land formations around your home and something this software is obviously unable to analyse. We have the Annual 5 yellow located in the south this year and it is wise to keep this area calm and quiet. Do not place heavy metal in this area of your home or office this month, as it will weaken the good earth. And also feed the annual #7 star. This cure and enhancer when used is a manifestation enhancer and it is good to place an image that represents everything you want to achieve in life, an example to some would be a picture of a beautiful home that you desire, a male or female that you admire, a car like a Ferrari or Mini, the number of children you would like, I think you are getting the picture by now, just create a dream board with all that you desire pinned to it or draw the image or you can even download some images from www.google.com this really is a very powerful way of manifesting your dreams and it really does work, remember to place the image in this area this month. 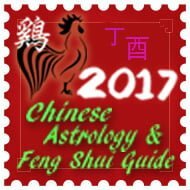 Whilst this star is very auspicious, if you have any poison arrows like lamp posts, pylons or large corners of house’s pointing toward this area consider hanging a ba gua wealth protection mirror outside pointing toward the offending object as the #4 star can bring both wanted and unwanted romantic opportunities to the household if the cures are not put in place. Do not use fire or metal in this area or colours white, silver this month. Do not worry if you have these colours already just introduce colours blue or black in the way of a floor mat, cushions, tablecloth or such like. 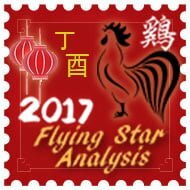 Traditionally, you should avoid fire element and colours red, pink or purple for the #4 star although we have been using the fire element to weaken the bad annual #3 so my advice would be to keep the red in the west if you already have it as both the visiting monthly star and annual star are wood elements. If you wish to enhance areas of creativity and academic achievements, place or hang moving objects to enhance the Ch’i of this sector, do not use wind chimes. Keep area semi active with windows occasionally open.